One of the benefits of our amazing gay lifestyle is that we love to travel, we go to all these amazing events and parties. But not always we are sure that we are booking a truly gay or gay-friendly hotel. GayOut went and scanned all the hotels around the world and found the best gay hotels or gay friendly hotels. Many of the hotels on our list are completely targeted at us the gay travelers, book these hotels to meet fellow gay travelers (and maybe enjoy a fling or two during your trip). Most important - once you book a hotel via GayOut you are sure you were always be welcome and accepted wherever you go. Enjoy your trip! It doesn’t matter if you like a soft bed or a hard one. Perhaps you prefer a shower, while others prefer to soak the night away in a tub. We know that hotels cater to all types of travelers, so you will likely find just the amenities that are important to you if you look hard enough. Even with all that, however, there is something lacking if you do not stay in a hotel that specifically caters to the gay traveler. We do, after all, have special and unique needs, and this requires a special and unique hotel just for us! From gay owned and oriented hotels to those that are at least visibly friendly to our lifestyle and needs, there are some great properties located the world over. Some are hidden gems, while others are in the mainstream and easily recognizable in most gay circles. Here is a list we compiled of the 10 best hotels for today’s gay traveler to get the planning process started. Glenely, Australia – The Stamford Grand Adelaide – The Stamford Grand is spacious and clean and has a lovely view. There is a tram station just outside the hotel so you can get into the city quickly and easily. The rooms are very comfortable and the room service is very generous. Guests can go to the nearby beach or can swim in the rather large hotel pool. Koh Phangan, Thailand – Panviman Koh Chang Resort – Panviman Koh Chang Resort has some of the most amazing views in Thailand, overlooking the beach. The drinks and food are not over priced and the staff is quite helpful. One of the best rooms you can get is the deluxe cottage is right on the beach. There are hammocks hanging between the palm trees so guests can enjoy the sand and sun. We already know that Thailand is one of the best gay destinations in the world, and now there is a hotel that rivals any around the globe as well! You can play hard, see some of the hottest guys anywhere around, and relax in comfort at the end of the day. Life truly doesn’t get any better than this! London, England – The May Fair Hotel – The May Fair Hotel is best known for incredibly comfortable beds. The rooms are very stylish and there is a lot of storage so you can really settle in and unpack your bags. Making yourself at home is not a problem in the large rooms. While the hotel is fairly expensive, it has all the amenities to make it your home away from home. Barcelona, Spain – The Ohla Hotel – The staff at Ohla Hotel strives to ensure absolutely everything is the way that you like it. They even ask you what type of sheets, pillows and room scent you would like when you book with them. The entire hotel is very clean and well looked after. Throughout Barcelona, the Ohla bar is well known for its affordable, delicious drinks and guests are just steps away from it. Paris, France – Hotel Astor – The Hotel Astor is one of the many gay-friendly hotels in Paris. However, it stands above the rest because of its incredible value. The rooms are small but well decorated and very affordable for those on a budget. The staff is pleasant and helpful and the hotel offers free WiFi as well as a delicious spread for the breakfast buffet. New York City, USA – The Duane Street Hotel – It is hard to find a good hotel in New York City that is affordable, but the Duane Street Hotel is exactly that. The hotel is close to the subway so it is easy to get around the city for sightseeing. The rooms are fairly small, but they do fit a king sized bed and are very cozy and comfortable. Naples, Italy – Romeo Hotel – The staff at Romeo Hotel is very welcoming and professional. The hotel offers beautifully decorated rooms adorned with unique art. At the hotel bar, guests enjoy the talents of bartenders renowned for their unique and custom cocktails. The Romeo Hotel also has a restaurant that serves up some of the best of Italian cuisine in the area. Stockholm, Sweden – The Nobis Hotel - The Nobis hotel has an excellent location that is right near everything in Stockholm. It is only about a ten minute walk from the old town which is where a large variety of shops and restaurants can be found. The hotel is spotlessly clean and has an amazing bar. The rooms themselves are a nice size and the bathrooms are cozy but well designed. Cape Town, South Africa – The Commodore Hotel - The Commodore Hotel is known for excellent concierge service. The hotel is right on the waterfront with some of the best views in Cape Town. Breakfast is included with your room. There is also room service that is not overpriced, so you can eat late at night without breaking the bank. Honolulu, USA – Hyatt Place Waikiki - The Hyatt is only three blocks from the beach. Not only is the hotel close to the water and all of the downtown shops and restaurants that Waikiki is famous for. They offer a free hot breakfast, wifi and a gym for the guests to use. The rooms are very clean and quiet and the hotel itself is right down the street from two of the cities greatest gay bars. The city has some awesome night markets to look through just around the corner from the hotel. There you have it – A list for the ages. When traveling, where you stay is almost as important as the destination itself. Do not ruin a vacation by selecting a hotel that you will not feel free to be yourself. The hotels on this list are well respected not only because of the level of comfort that they afford their guests, but also because of their orientation towards gay clientele. Be treated with the dignity that you deserve, have a blast all day and all night, and sleep well! 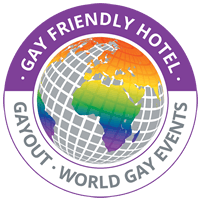 Check out our full list of Gay/Gay Friendly hotels. Do you have more recommendations for Gay & Gay friendly hotels? Feel free to add them to the comments section.